Missoula, MO — In a move that will likely get him uninvited from any further speaking arrangements for the Republican party, Senator Rand Paul called out the hypocrisy of US arms deals with Saudi Arabia and reminded Republicans that the Saudis have done far worse things than kill WaPo journalist Jamal Khashoggi—like 9/11. As the mainstream media continues to focus on the death of Khashoggi, all of the major outlets are ignoring the genocide carried out by the Saudi regime in Yemen—likely due to the fact that it is supported by the United States and the military industrial complex. Also, just before the death of Khashoggi, the Senate voted to declassify hundreds of documents that further exposed the Saudi Arabian role in 9/11. Rand Paul, on the other hand, doesn’t appear to be in the same trance like the rest of Washington and he was quick to call out the regime for their crimes and decry the US government’s support for them. 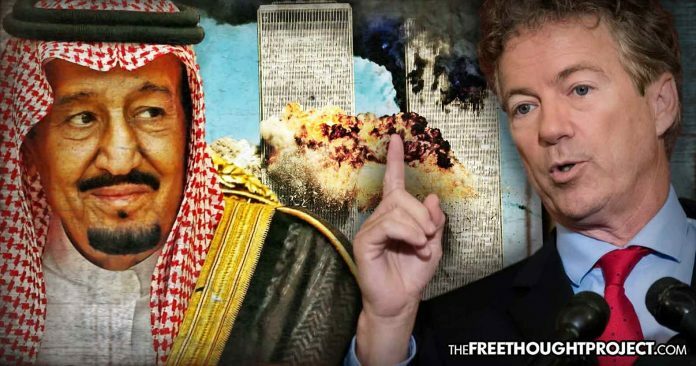 “We have to think through this idea that everything is going to be blindly for Saudi Arabia, they’re involved in a war in Yemen where tens of thousands of civilians are dying,” Paul said. Rand then went further and reminded the crowd, who was there to see Donald Trump Jr. campaign for Senate Republican candidate Matt Rosendale, that the Saudis helped carry out 9/11. For those who remember, Donald Trump himself used to tell people at his rallies that the Saudis were behind 9/11—a habit he quickly abandoned once he got into office. “Why Do We Have Worldwide Terrorism? The Saudis Fund It,” He Added. Rand Paul then went on to explain to the crowd that good allies are ones that don’t ask us to support them in wars of aggression in which children are murdered and starved to death. And good allies are ones who support the constitution, not who lock women in cages for wanting to drive cars. “What I want are allies that will come to Washington and say this: the Constitution demands that the people through their representatives vote on when we got to war,” he said. Paul then went on to seal his fate and essentially guarantee that he’ll not be allowed at another rally by calling out the facade that is Trump’s plan of sanctioning 15 people in Saudi Arabia for the death of Khashoggi. “I think sanctions are a way of pretending to do something. If you sanction the 15 thugs that the crown prince sent to [the consulate in Istanbul,]you’re sanctioning 15 thugs and they’ll just get 15 more thugs,” he said. “Saudi Arabia will see that as a way of pretending. It’s a way of acting tough without being tough,” he said. Paul is one of the few people in Washington who is currently pushing for a Senate vote to block an arms sale to Saudi Arabia that Trump values at $110 billion. “Saudi Arabia has done a lot of bad things. They spent $100 billion on radical Islam,” he said. For those who don’t recall, it is a fact that 15 out of the 19 hijackers on 9/11 were from Saudi Arabia. Also, last year, for the first time since that fateful September morning nearly 17 years ago, families of victims of the 9/11 terror attacks used a new law to go after Saudi Arabia in lawsuits for their role in the attacks. During the trials, evidence was revealed showing the Saudi Arabian embassy in Washington may have funded a “dry run” for the hijackings carried out by two Saudi employees. What’s more, as TFTP has previously reported, thanks to the release of the 28 pages, Americans and the rest of the world now know that Saudi Arabia played a significant role in the September 11th attacks. Also, thanks to the release of 28 pages, we know that the US government was complicit in covering up Saudi Arabia’s role in the attacks. For a decade and a half, Presidents Barack Obama and George W. Bush kept secret the alleged role Saudi Arabia played in the September 11 attacks on America. Because of the cozy relationship the US has with the terrorist nation—which Trump is complicit in maintaining—special interests within the government have chosen to protect their Saudi friends instead of telling Americans the truth about what happened that fateful day. Despite repeatedly pleas by activists and politicians alike, the US government has overwhelmingly looked the other way in the face of all the evidence and human rights abuse, opting instead to ignore it and sell the tyrannical country weapons they are currently using to carry out genocide in Yemen. Regardless of your party affiliation, Rand Paul deserves praise for bravely going against the establishment and calling out the US for their continued support for the terrorist nation. Please share this story to help inform your fellow Americans of the horrific crimes committed by the Saudis who are continuously supported by your tax dollars.